After struggling with your everyday activities, you probably want to cool down yourself by having a bath. The moment water touch your skin you’ll feel back to yourself again. Looking for bathroom shower tile ideas? Take a look at our list that we guarantee it’d amaze you. Adorning a bathroom requires good knowledge since different type of materials serves a different purpose that you should pay attention to. We have gathered some unique bathroom shower tiles for you along with their advantages and disadvantages. Pebbles make quite a beautiful look for bathrooms if they’re applied with good thoughts. It’s because of their special shapes and colors. Pebbles can be used for bathroom floor or wall either. They too are fairly durable – depending on your sense of style. This bathroom is visually attractive. The selection wall tiles are a good match, don’t you think? The glass wall shots a transparent view that can easily be seen from outside the bathroom what it looks like inside. Glass walls are usually installed to make a bathroom look spacious and have a natural lighting. They obviously play a critical role in some degree in a way that it makes a beautiful appearance of the bathroom. Pebble has a distinctive characteristic and makes an attractive look. Since it has different shapes and uneven level tile, it’s quite time-consuming when it comes to cleaning. With a multitude of colors and styles, porcelain can be a terrific choice for your bathroom shower tile. Porcelain is durable. It can survive with heavy traffic and minimize scratches. You can have a spectacular bathroom tile by installing porcelain tiles. Although they can be hard to distinguish, porcelain and ceramic aren’t the same; they’re different. Porcelain is harder than ceramic, low in porosity which means it absorbs less water preventing from germs to surface. It’s also stain resistant. It can be slippery, better watch your step. You may also want to consider its price. It’ll cost you quite a fortune. By looking at the luxurious appearance, you’ll soon know why marble tiles are fairly popular among homeowners when it comes to bathroom tiles. It does look beautiful from any angle and suits fine with stainless steel and the surroundings. The pattern adds an artistic visual on the wall and it looks clean and elegant – no more a plain, dull bathroom. The glass wall let the lighting comes through inside the shower cubicle. While a bath and towel are next to the glass wall. It will cost you quite a lot. There are a plethora of choices of styles, colors, and materials you can opt for your bathroom shower tiles. But first, you might want to consider their specific type and purpose, and their prices as well. Then you can begin to think what style you would love to use for your bathroom tiles. In this picture, the tiles have a beautiful herringbone floor. You can mix and match with the wall tiles or the theme of your home. Herringbone has a unique characteristic that you can easily notice it just by having a glance. It’s easy to be applied, and you can use it or combine with other tiles and colors too either for wall and floor tile as well. 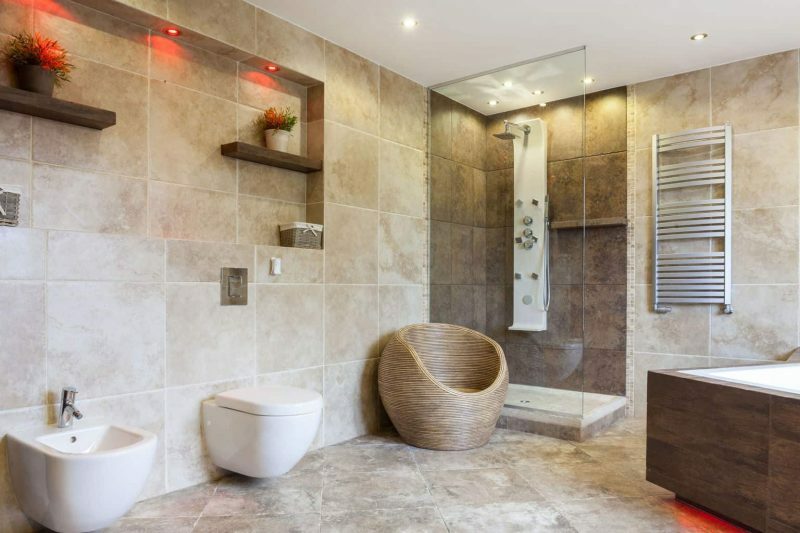 If you have a small bathroom and you’d like to make it look wider, one way to do so is by creating an open space. This small shower bathroom looks spacious because of the glass door and large flooring tile. The black tile flooring tones up with the glass wall and stainless steel rack towel. There are a vanity, toilet, and bath that suit down to the ground with the floor. While a tiny wood table is next to the bath with a towel and white sandals. The white ceiling maximizes the lighting very well. It can minimize the use of electricity for the bathroom. Another thing you should pay attention to is the floor is slippery so it’ll not funny if you run or make a sudden move in the bathroom. This bathroom features simple white subway tiles that cover most of the walls. It makes a great look with its simplicity. You won’t find it difficult to be used everywhere for bathrooms or in the kitchen walls or floors. Subway tiles have many colors it doesn’t limit with just white. You can have subway tiles with different colors you can even collaborate them with other styles. There are also a vanity and huge mirror. A bidet and toilet adjacent to glass partition. There are types of stone tiles that are used for bathroom or kitchen. Granite is one of them. It’s a type of stone tiles that gives an elegant look. A picture speaks a thousand words. Yes, it is. This bathroom has granite tiles all over the area of the bathroom, which makes it look stylish and appealing. You can see a rectangular area with a dark line and a herringbone style of tile arrangement to make it easy to distinguish that you’re now standing in the center of the bathroom – an example of how a creativity giving a nice touch. Many homeowners have their excuses for opting some specific type of tiles for their bathroom shower. After weighing some advantages and disadvantages of each type of tiles, they begin to look for a suitable tile. Despite needing an effort in maintenance, people end up choosing slate tiles because it’s unique, and has a high sense of style. That’s why they don’t mind spending a little of their fortune to have a handsome slate tile installed in their bathrooms. Now you may start to plan to renovate your bathroom and add some new look. Having an attractive shower bathroom can re-energize your mood as you have a shower and let cold or hot water touches your body and soul. In this bathroom shower tile ideas, we certainly hope it casts you light on bathroom tiles selection to help you make up your mind choosing one as we provide with great pictures advantages and disadvantages of each material.